I've found this new RAV4 to be mechanically very pleasant (not a far stretch to call it an RX350 junior) and comfortable. However, the controls have some serious misses. For a porky Corolla wagon, the RAV4 feels solid without seeming heavy and has lots of room for big and tall, as well as lots of stuff. 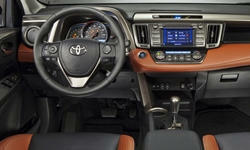 Why the 2013 Toyota RAV4? The powertrain is quite smooth - 6speed trans shifts nicely whether jabbing it or in traffic or manually shifting. The manual shifting works ok but toyota assumes it is smarter than you and will override - and the indicator will not match the actual gear. Power is decent, even with AWD - seems like closer to 200 HP. Engine sound is smooth. My rental is a nearly optioned out Limited with nav - only missing the blind spot monitoring system and JBL sound system. It is nice that a car under $30k has memory seats (seats only - not mirrors or anything else) - and the packages appear pretty reasonable for the equipment levels. The RAV4 is pretty well decked out for its price point, although I admit I am not intimately familiar with the competition or CUVs in general. The drivers seat has a really long travel - I normally have the seat far back (5'11" with long legs) but I probably had 6 inches of travel further back I could have gone. The seat isn't overadjustable and not too hard to get into a comfortable position. The fake leather is a reasonable facsimile and has heated seats - would have to see how it does in the direct sun. Rear seat room is pretty impressive and seating position is nice. Adjustable rake of the rear seat is a nice touch. Appears to have 3 car seat anchors. The rear seat appears to be the same size as, or maybe even larger than the original Highlander / RX300. The car took a pounding on DC's finest substandard streets (and a few backroads as I went searching for gravel - unsuccessfully - to test out the AWD and locking diff) and stayed straight, didn't bounce around either from firmness or floatiness. 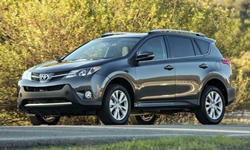 Why Not the 2013 Toyota RAV4? Car equipped with nav system. Touch screen not very sensitive and menus difficult; visibility not that great either. The Entune system requires the phone to connect via USB and have the app running locking down the phone - it will NOT work via bluetooth (seriously Toyota?? ), but BT-Audio works well (and pulls album cover photos from iPod list in my iPhone). Backup camera quality very good and grids are nice, although they don't swing with the steering like Nissan's system. Audio system sounds decent. Voice recognition, well, wouldn't recognize anything I attempted to command it. Admittedly, though, I don't have a lot of luck with these systems (the Honda system, menu driven, I have better success with). Unpainted black bumpers, even on the Limited trim? Looks cheap. The square, blocky back is just flat ugly. This car has a face only a mother can love. The IP is nicely laid out and the multi-information display is fine. The engine temp indicator LCD is a little strange - but the controls go downhill from there. The steering wheel has a multitude of buttons and are not terribly intuitive - if you have to look down, you've just defeated the purpose of steering wheel controls. The rear liftgate button is completely hidden behind the steering wheel (although it is at least lit at night) next to the locking diff button. The biggest miss are the heated seats and transmission mode (sport and eco) switches/buttons - they are low and under the protruding panel with the HVAC controls, hard to see and hard to reach. Major fail. As noted above, the touchscreen is not very sensitive nor intuitive. Also, the HVAC defaults to recirc mode instead of fresh air, and the pollen filter has to be manually activated and shuts off after a few minutes. I've only been driving in heavy traffic and urban cycle, but so far the computer calculates that the car is a complete pig - 16 MPG average with the auto temp on (so AC running). My FR-S easily handles the same in the mid-20s. Maybe less idling / crawling / jackrabbit starting and I'll get the average up. After 3 days and more "normal" driving (some highway in there), I hit low 20s (if the calculator was right - it could be 2 MPG optimistic like the one in my FR-S). The power adjustment switch for the rear view mirrors was not mounted correctly - a clip or something had broken and the switch was recessed. Also, the hood flutters on the highway - the center part of the hood next to the cowl visibly moves. The rental guy and I checked out two other new RAV4s and they each appeared to have the same issue. Quite disconcerting.